What’s New in the Upcoming WordPress 3.5 Release? You are here: Home / News / What’s New in the Upcoming WordPress 3.5 Release? 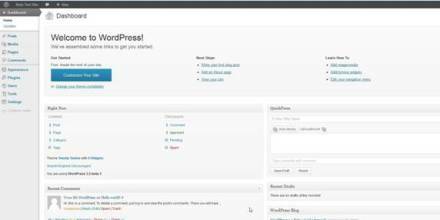 The official release of WordPress version 3.5 is coming in December 2012 and we’ve had a chance to take a sneak peek and have a quick play around with the WP 3.5 beta 1 version. The WordPress developers have made something like over several hundred changes and most of them are under the hood or something developers would be normally interested in but there are also some neat and visually more obvious functional changes for the rest of the WordPress users. The much overdue Twenty Twelve theme will now become the third native WordPress theme available as part of the WP installation alongside the Twenty Eleven and Twenty Ten themes. Responsive theme – Twenty Twelve is a fully responsive theme and is actually the first native WordPress theme to be fully responsive. This responsive design feature makes it very user-friendly for mobile web users. It adjusts really well to smaller screen sizes without losing or compromising much of the basic page functionality. Better Typography – The Twenty Twelve theme comes standard with the Open Sans font family via the Google Web Fonts directory. Although many people overlook the importance of typography and readability of their web pages, this theme will at least give you a very stylish and readable font by default. 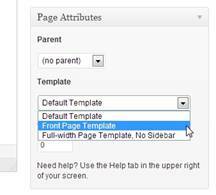 Front Page Template – this theme also includes a special front page template which has its own dedicated widgets. This really highlights the versatility of this theme and opens up the options for how one can display their front page. The media uploader has once again seen another improvement. In the 3.3 major WP release we saw the introduction of HTML5 Silverlight for media uploads. Although the new release doesn’t quite boast such a major enhancement, it does give the user a much improved experience. When a user clicks on the upload media button they will get the usual drag/drop box but in addition they will see a displaying of a gallery of uploaded images. When an image is clicked an insert button appears which the user can click. When you fire up WP3.5 and go into the administration panel you might not notice the fact that the “Links” menu item has disappeared. This could be due to the fact that you never really used this item before. If you have been using this feature and are concerned that you can’t use it when you upgrade to 3.5, fear not, because you can install this plugin to revive the links feature if you wish. When you first log into the admin panel of your WordPress 3.5 installation you will notice some subtle changes in the administration screen. Firstly the welcome screen has changed and arguably it is a lot more user friendly. For example under the “Welcome to WordPress!” heading there are some easily referenced links for people who are new to WordPress and need guidance in starting with their blog’s construction and design. If you like to use your keyboard to navigate around pages then you will appreciate the 3.5 release. For instance as soon as you log into the admin panel try clicking the <tab> button to navigate around the page and you will see some improvements. As you tab across each main fly-out menu item it will automatically open and traverse along the sub-menu items. With WP3.5 you can now also quickly reference any plugins which you may classed as “favourite” in wordpress.org by clicking on the new item in the “Install Plugins” window called “Favorites”. External libraries updated: TinyMCE 3.5.6. SimplePie 1.3. jQuery 1.8.2. jQuery UI 1.9 (and it’s not even released yet). Also added Backbone 0.9.2 and Underscore 1.3.3, and you can use protocol-relative links when enqueueing scripts and styles. WP Query: You can now ask to receive posts in the order specified by post__in. XML-RPC: New user management, profile editing, and post revision methods. Multisite: switch_to_blog() is now used in more places, is faster, and more reliable. You can now use multisite in a subdirectory, and uploaded files no longer go through ms-files (for new installs). TinyMCE: Added API support for “views” which you can use to offer previews and interaction of elements from the visual editor. Posts API: Major performance improvements when working with hierarchies of pages and post ancestors. Also, you can now “turn on” native custom columns for taxonomies on edit post screens. oEmbed: Added support for some oEmbed providers – now can handle SSL links. As stated earlier there is much, much more which has been added to the new 3.5 release but we hope that this article has given you a taste of what to expect. What’s New in the Upcoming WordPress 3.3 Release? I was really hoping to see improvements in the way URLs are generated with reference to custom taxonomies. Currently you cannot have duplicate sibling slugs across different parents which makes WordPress one step away from being my favourite CMS. Best blogging tool – Yes, best CMS – almost. @Cameron, Yes WordPress 3.5 is in beta at the moment. The final version is scheduled to be released in December. This is Beta version right? Do you know when the final version of WordPress 3.5 will be available? Hallelujah for keyboard shortcuts!!! Thanks for the heads up on the new features. Hi, Thanks for this rundown of the WP 3.5 feature list. Looking forward to the twenty twelve theme.